My fabulous coworker Stephen told me about Kaas Glassworks after shopping there in the West Village last weekend. Gorgeous dÃÂ©coupaged trays, plates, paperweights and coasters with vintage graphics of flowers, plants and fashion. The above are coasters from the company that are being carried currently by Spiegel. If you’re in New York, visit the store… it is absolutely adorable. 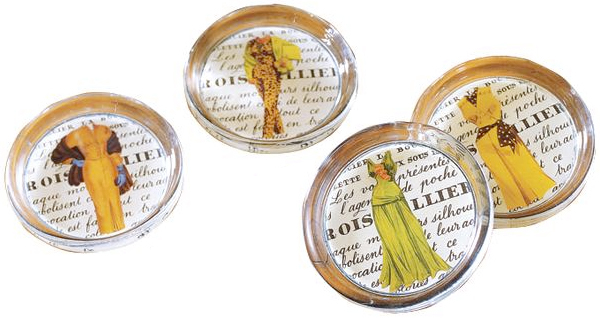 Vintage Fashion Coasters, $66 @ Spiegel.